A major obstacle to branching out to such uncharted territory, is that foreign architects often "psych" themselves out, obsessing about the "developing" part of the context, heart-broken over the apparent poverty and destitution they are witnessing or expecting to witness. They easily become driven by an irresistible need to fix it all and "save" everyone, which is very noble I guess. But I wonder what that has to do with the work of architecture itself, aside from the fact that we feel good about ourselves when we design for such contexts? This obsessive focus on poverty (or rather what we interpret as such), can easily distract us from actual important design goals. Essentially, this expresses itself as a need to provide what we see as indispensable in our "developed" context and set out to reproduce it in this "developing" context, assuming it is a universal requirement for a dignified life. So we obsess over getting electricity or hot water into the projects we design for example. This can easily eat up a lot of budget, leaving very little for the actual spaces we were supposed to create. Unless you are designing a clinic, hot water in Africa is probably something you can ignore. I remember boiling a pot of water in the morning, during the colder season, for my bath when I was growing up and I didn't feel destitute for it. Don't get me wrong, it was awesome when we later had running hot water. It allowed me to sleep longer in the morning, was less hassle, but was by no means a vital need. Procuring water in many parts of the developing world is important (and there are NGOs that work on that problem)... making sure the water is heated is not as important. When one succumbs to the need to mirror Western ways for living, designing the right spaces, with the right tools and materials quickly takes a back seat to providing an infrastructure we believe people need because we cannot imagine our own lives without it. the project was for low income households. This meant that, while having a water heater is a nice comfort, they probably wouldn't be able to afford the gas bill from running the heater anyway. Another non-intuitive example is that depending on the part of the world you live in, "un-built"/open space can be more important than the built structures. In regions where the climate is harshly hot and community life is important, life is often lived outdoors. 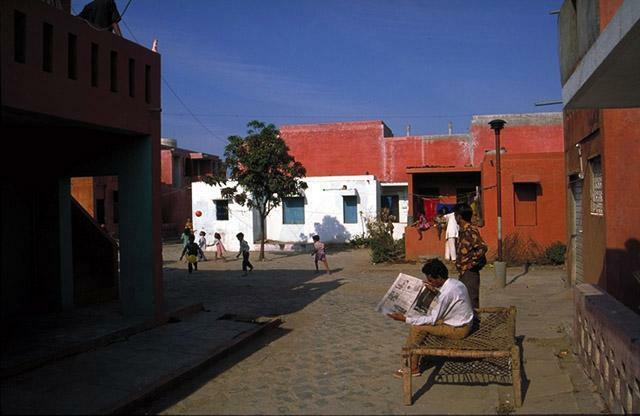 A favorite of mine is from the Aranya Community Housing project in Indore, India . 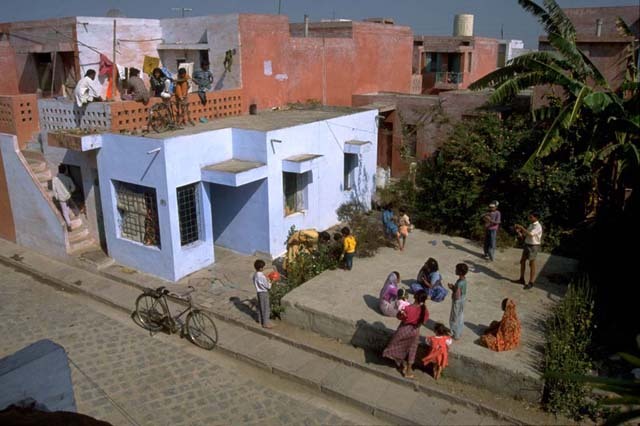 The project was to provide low income housing in Indore, while preserving the sense of community that had developed on the site when it was still a slum. One thing the architects' investigations uncovered was the fact that when communities initially settled in the slum, every so often, they planted a tree, which was to be a marker for a small public space in the "neighborhood", and it was understood to be such. Of course, as public spaces go, it would have been nice to have one that shelters from the heavy monsoon rains for instance. But the point is that a public space can be achieved that simply, provided space is carved out for it. Instead of using that real-estate to accommodate car traffic, designing these small community spaces became a focus of the project. Ultimately, focusing on the "developing" nature of a place is a distraction that can take away from the real process of architecture. The problem is that we quickly try to "develop" what we see into something that we know and that we accept as inherently important. Basic things like shelter, dignity, comfort, and beauty, can be taken for granted as universal needs. Nicely laid-out, car-friendly roads, and water heaters are not.